In the days before television, Australians were kept abreast of current events through the weekly newsreels of Cinesound Review and Movietone News. Each company had its own star cameraman – at Movietone it was Ross Wood and at Cinesound it was his brother Syd. 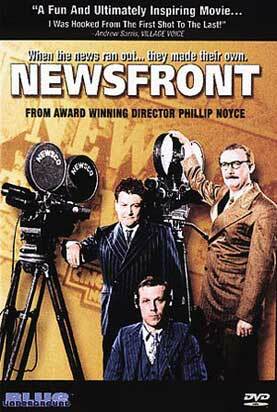 The rivalry between them was legendary and, as conflict is the basis for good drama, it was only sensible that writer Bob Ellis draw upon it for his screenplay of Newsfront. Ellis largely disowned the script before the film went on to garner worldwide acclaim and on the DVD commentary he laments the loss of partnership between himself, director Phillip Noyce and producer David Elfick, which, had it continued might have delivered up other comparable masterpieces. At the time, however, no one involved thought the film would click-Noyce spent days in bed contemplating life as a school teacher after viewing an initial rough cut. It was Elfick who came up with the concept of cutting original black and white newsreel footage with scenes recreated using actors; the ’54 Maitland floods and the Redex Trials for instance. He also thought of centring the story on the cameraman as hero. Bill Hunter is Len Maguire, a guy who has pretty much seen it all and is showing the ropes to his young sound recordist (Chris Haywood). While his puritan wife (Angela Punch McGregor) is at home pumping out babies, Len is drawn to the ravishing, chain-smoking production assistant (Wendy Hughes) who also happens to be the girlfriend of his brother Frank (Gerard Kennedy).